Serta is proud to be the number one mattress manufacturer in the United States, and a leading manufacturer worldwide. Find your brand new Serta Mattress for less at Billy Bobs Beds, see our specials below and come on in to learn more! More gel. More coils. iSeries® is now redesigned with more innovations for 2014. Are you interested in the benefits of a memory foam mattress, but prefer the comfort and support of a traditional innerspring? 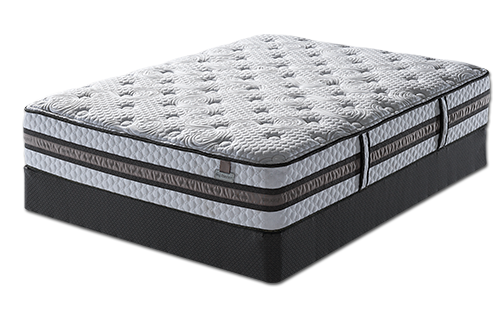 It’s time to experience the iSeries® Hybrid Sleep System by Serta. Our iSeries hybrid mattresses combine the same memory foam innovations found in our all-foam iComfort® Sleep System with the support of an advanced innerspring. This unique construction works to provide intelligent cradling and cooling comfort at the sleep surface with deep individual support for each sleep partner. The new premium iSeries® Profiles™ collection combines our most advanced comfort and support technologies with a luxurious and sophisticated design. These are the only iSeries models to combine our exclusive hybrid mattress technology with our new EverFeel™ Technology for a difference you’ll feel the moment you lie down. Every new iSeries hybrid mattress features our Cool Action™ Dual Effects® Gel Memory Foam – Serta’s latest breakthrough in gel memory foam technology. This is the world’s first material to combine both our original MicroSupport® gel and our MicroCool+™ gel in a material with up to 25% more total gel than our original formula. Plus, we have upgraded our exclusive Duet® Coil Individually Wrapped Coil Support System by adding even more Duet Coils to properly balance comfort and support across the mattress. All prices subject to change. These prices valid at time of purchase only and not valid at a later date. Website Design by: Alarie Design Associates. Inc.
Billy Bobs Beds is an anti-discrimination place of business. Billy Bobs Beds promotes inclusion in all areas of diversity. Billy Bobs Beds does not discriminate based on any factor of ethnicity, race, gender, sexual orientation, religion, age, language, disability, socioeconomic status or country of origin.